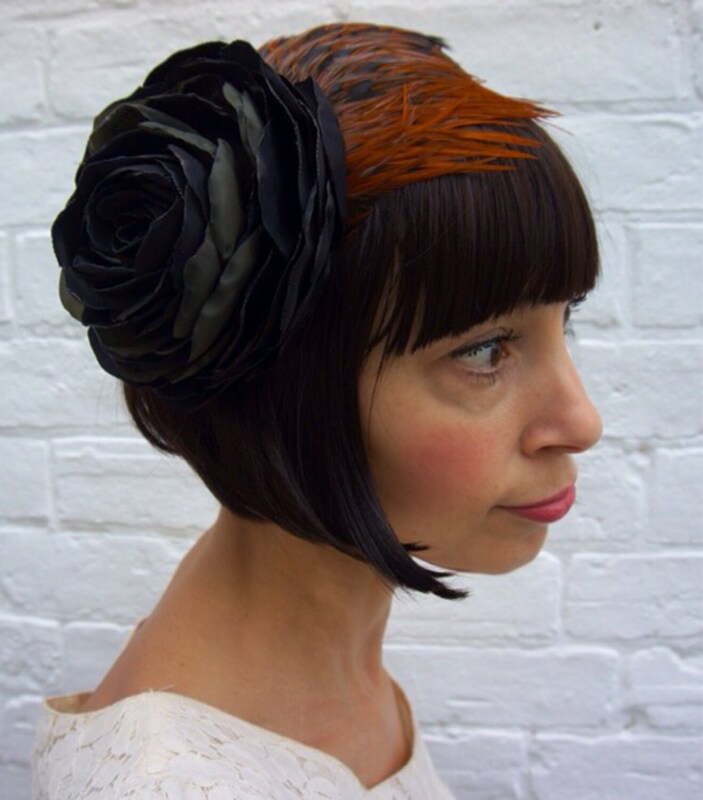 This beautiful flower headpiece has been handmade out of recycled vintage fabric in different shades of black, it's set on a black aliceband and has a brown and iridescent black feather wing that sits across the head, it's backed with a piece of recycled black leather. It has been hand cut and shaped using cleaver stitches to look realistic. And it has been aged and distressed to give it a vintage antique look. This flower for be perfect for the races a wedding or garden party. Would also look striking worn at one of the summer festivals for a very different festival look. The flower measures 6" across. Please ask any questions about this or any of the other items. Stunning headpiece arrived perfect thanks for sending all the way to Australia! Absolutely gorgeous item. Perfect! Thanks so much, Emma. You are a star. I don't except refunds or exchanges, Each item is hand made by myself, and is tested for longevity. All items will be sent out 1st class recorded delivery. Those shipped abroad outside the UK will be sent by Airsure all items will be sent out within 24hrs of the payment clearing on my paypal account.